Delivering clinical services to meet a community need is exciting and challenging. It is part of a process that builds on planning and becomes refined through evaluation. The organization is ready to deliver services after it has participated in a community needs assessment and a planning process. Some issues related to service delivery cut across behavioral health service settings. They are related to the organization's capacity to carry out treatment practices competently. The planning stage has allowed the organization to choose the setting and service, put into place policies and procedures that guide the delivery and financing of the service and create capacity through selection of appropriate personnel, facilities, and equipment. The next challenge is to implement and monitor the actual service provision. 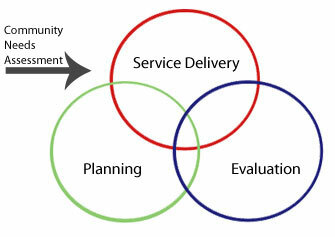 There are many facets of service delivery that need to be considered simultaneously. A simple way of conceptualizing service delivery issues is to consider the workforce, service recipients, and organizational practices. Clinical service delivery in behavioral health is a combination of "evidence based practices" and practices or interventions that may be promising, but without a body of research yet to support it. It is important to choose the interventions that will be sanctioned by the organization to avoid engaging in those that research has proven as ineffective or harmful.